Donald Trump definitely praised Vladimir Putin. Trump Says He Never Praised Putin. That’s Just Not True—Trump Loves Putin! 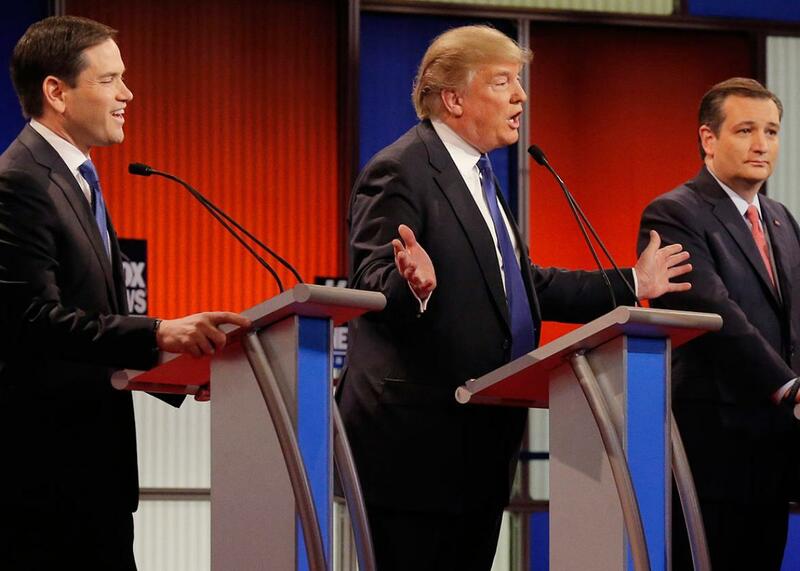 Donald Trump gestures toward rivals Marco Rubio and Ted Cruz at the Fox News debate Thursday in Detroit. Marco Rubio attacked Donald Trump at Thursday’s debate for expressing admiration for Vladimir Putin. “Wrong, wrong, wrong!” Trump said, before explaining that it had been the other way around. There are a few things wrong with this account. Morning Joe host Joe Scarborough brought up the fact that Putin has been accused of ordering the killing of journalists and political rivals. “He’s running his country, and at least he’s a leader, unlike what we have in this country,” Trump replied. In my dictionary, yarkii can be ‘clear, bright, dazzling.’ You sometimes hear Russians using the term to denote the bright sky of a bracing, clear morning. I’d go with something like vivid. The word also could mean garish, but I think Putin was trying to be complimentary, and garish would be criticism.